Thanks bought 2.  Added. Thanks, ordered. Did have a 32GB for £9.61 on S&S coming next week but may cancel now. Any good for the yi out door cameras? Hot! Was just looking for one. I’m using these in my Yi camera (HD 1080p). They are capable for 4K video recording and are excellent cards. Thanks. Bought 2 for £14.98. Had a £10 promotional voucher I forgot about. Great price. Reliable card too. I’m using these in my Yi camera (HD 1080p). They are capable for 4K video r …I’m using these in my Yi camera (HD 1080p). They are capable for 4K video recording and are excellent cards. Isn't the Yi 1080p limited to 32gb or less? Says so in the stats. Devices can often work with higher capacities than those stated, but its hit and miss and there can be unforeseen issues. Anecdotally, my dashcam states it worked with cards upto 32GB.I used a 64GB card in it and most of the time it was fine, but over a few months I discovered that it stop being written to at some point in a journey. Not at the end of a file or a certain time in, but just randomly. This happened on a couple of different 64GB cards, but never on the 32GB cards I've used, so I assumed it wasn't a faulty part of the storage and it was most likely due to the 64GB capacity of the cards. I've never been sure whether it was because of SDHC vs SDXC or what the reason was. Annoying. I picked up a couple of these a week ago when they were about £16.50... what a price drop! Heat. Anyone using it with sony a6500 and working ok for 4k filming? 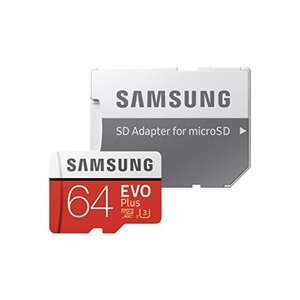 Some websites says there are issues with Sony camera and Samsung SD cards. Are these high endurance for dash cams? Great found, bought 2, thanks!! Will this work on a gopro hero 5 black does anyone know? +1 on that! Have some MOLTEN heat on your find! Have you tested them ? I've bought 4 EVO 64 in 2015. They run in dashcams recording at 2K. No problems with them. Today I bought 4 more, to replace those old ones. Have you tested them ? I've bought 4 EVO 64 in 2015. They run in dashcams …Have you tested them ? I've bought 4 EVO 64 in 2015. They run in dashcams recording at 2K. No problems with them.Today I bought 4 more, to replace those old ones. of course they work but they are not high endurance. Normal read/write life cycle is shorter. Out of curiosity, how many hours per day you used them? Annoying. I picked up a couple of these a week ago when they were about …Annoying. I picked up a couple of these a week ago when they were about £16.50... what a price drop! Heat. Any good Amazon deals on a 128GB card? I need one for my Switch. Weren't these the ones which were half price at carphone Warehouse (from £29.99 to £14.99) and on 3 for 2 last week? So worked out at £29.99 for 3. Sure i saw the deal on this site. seems like the deal has expired. bought this a week ago for £16.99. I still can see 11.99£ in my account.